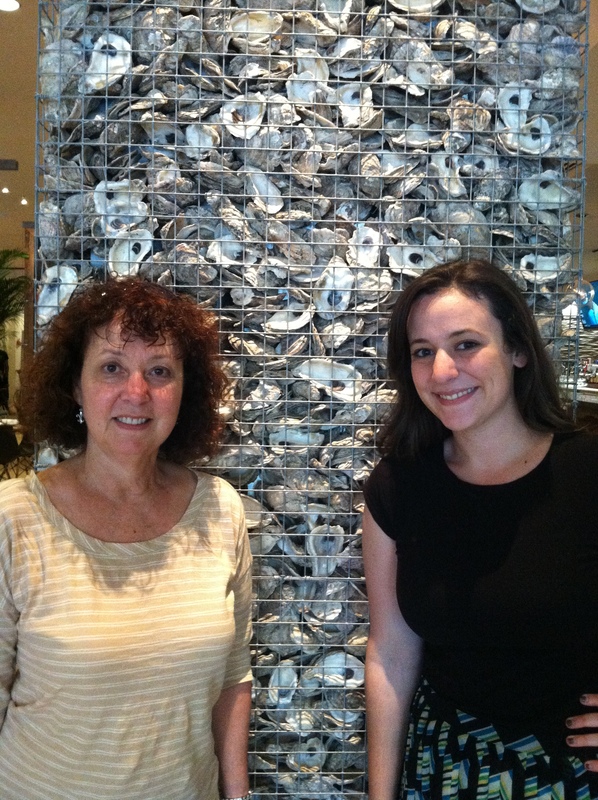 Our daughter, Lindsay, decided to book a room at the Blake in New Orleans for a belated Father’s Day gift. So off we went to New Orleans this Saturday for a culinary adventure with my wife, Jo, and our daughter and her husband, Chas. Our first stop was the Cowbell for lunch. The building was initially an old filling station, therefore there’s a hip, retro vibe to the place. They take pride in their hand-crafted burgers. The daily specials in the 10 to 15 dollar range are usually superb. The girls had the Cowbell burger with Swiss and were very pleased. Chas had one of the specials which consisted of a chicken-fried quail and waffles with country greens and a house-made sausage gravy. 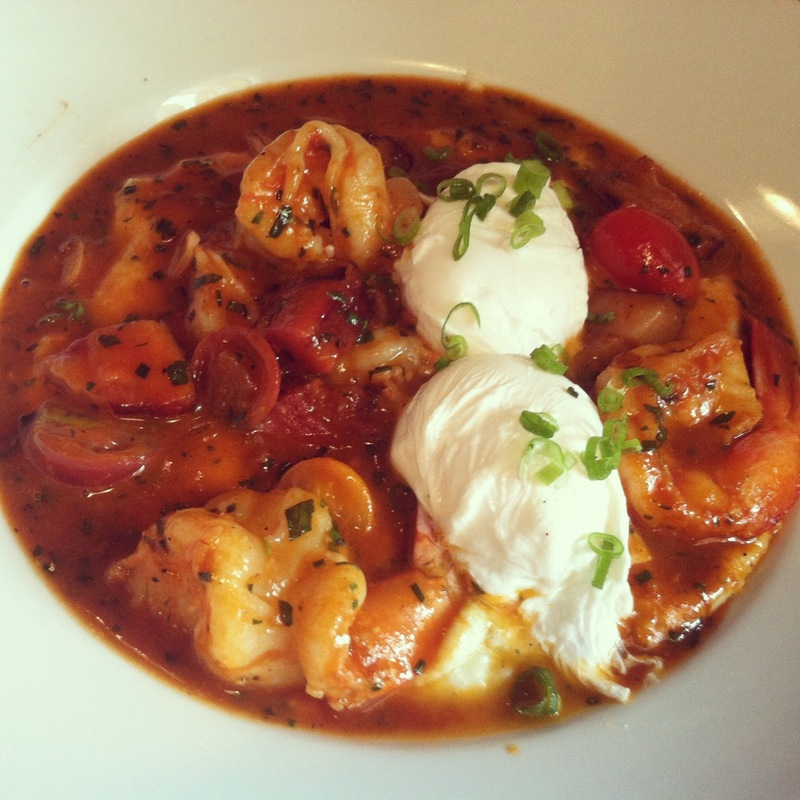 I also had a special of shrimp and grits with smoked bacon, heirloom tomatoes, white wine, and two poached eggs. The yolks from the eggs elevated the rich and smoky brick-red sauce. Of the many I have tried, this was the best version of shrimp and grits. 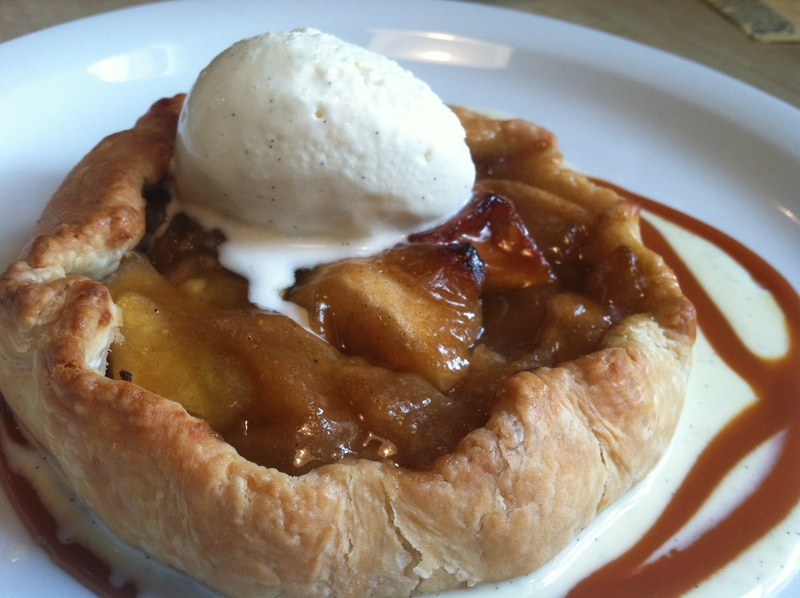 We ended the meal by splitting the apple pie with vanilla ice cream. They call it a pie, but it’s really a tart. It comes out hot, and boy is it good. After checking in at the Blake, we ventured to SoBou in the French Quarter for happy hour, which is from 3 to 6 p.m. There are drink and food specials in the 3 to 6 dollar range in this hip-looking bar and restaurant. After having a few beers and having a number of appetizers, we decided to move on and try the happy hour at Borgne. We were a little disappointed in the limited menu of drinks and tiny portions and quality of food at SoBou. 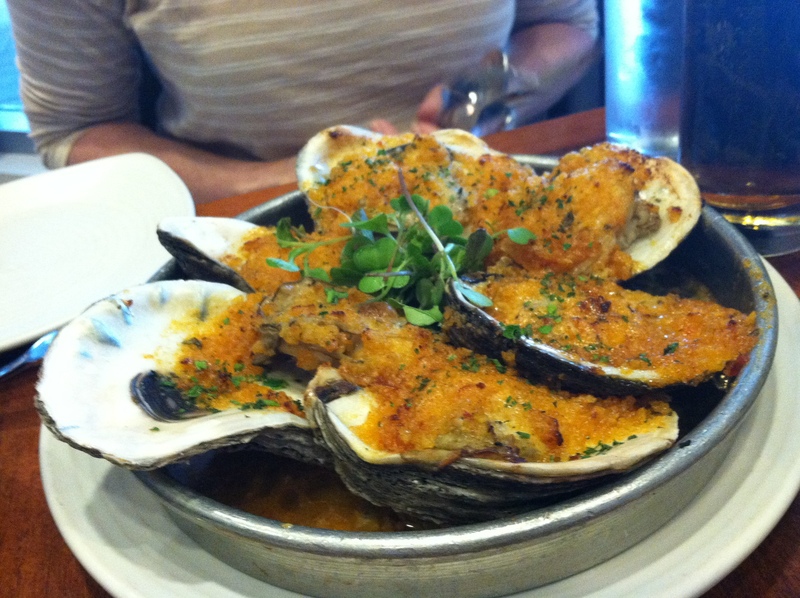 The Borgne restaurant is owned by John Besh and is in the Hyatt Regency hotel. Happy hour is from 3 to 6. In contrast to SoBou, all of the beer menu is half price, along with wines by the glass. The restaurant has a clean, open feel to it with many references to Louisiana, highlighted by square columns built of oyster shells. We had a great time, great appetizers, especially the fried calamari, drum ceviche, and baked oysters. I had a great glass of zinfandel by Steele Vineyards. Everyone loved it, which resulted in me ordering a glass for all. After happily leaving Borgne, we started walking back to the hotel on Poydras Street. Lo and behold, we walked right in front of the Japanese restaurant Horinoya. 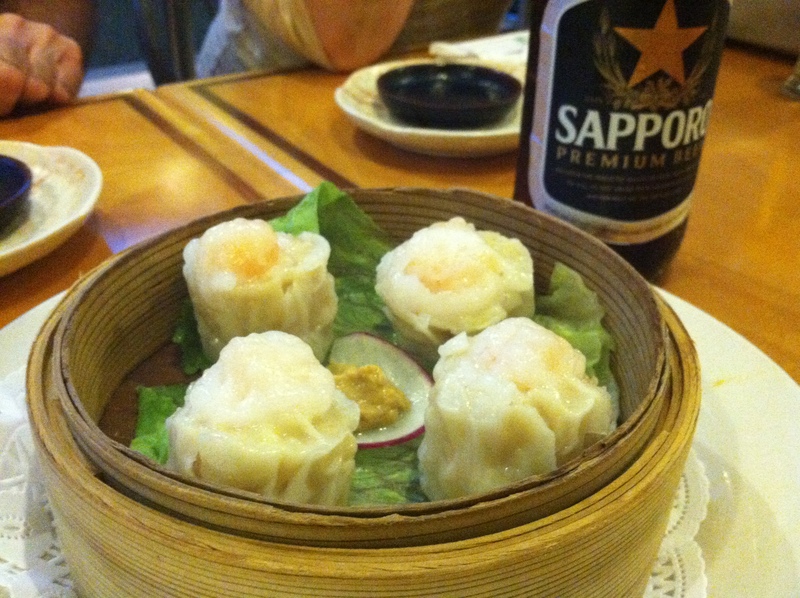 I suggested us trying a few of the hot appetizers with some Sapporo. Everyone was game. When you’re at the dance, you might as well dance. We tried four items. We had the shrimp gyoza, which are shrimp dumplings served with a dipping sauce; the fried soft-shell crab; the chicken yakitori, which is basically grilled chicken on a stick; and we also had grilled tuna collar. That was the first time any of us had tuna collar. Everything was very tasty, and everyone agreed we will be back to try the sushi and more of their menu. Although late, this was a great way to celebrate Father’s Day.